I don’t think I’ve ever taken SO LONG to read a book I enjoyed SO MUCH. Seriously, I don’t know what took me, maybe it was because I was reading this as an eBook (a format I don’t typically reach for), or perhaps it was the pacing of the book. 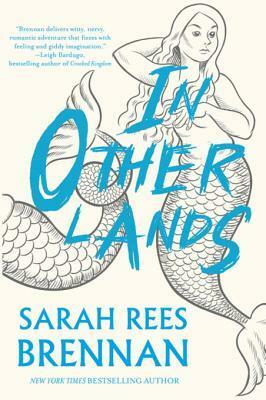 And In Other Lands has a very unusual pacing to it. Yes, it’s about a 13-yr-old boy (Elliot) who goes to “school” in a different world (a fantasy world with mermaids, harpies, elves, etc) and it’s about Elliot meeting and making friends, discovering truths about himself and his orientations through multiple relationships, and it follows Elliot until he’s 17 and graduating from said school. But within that plot, there’s quite a few moments where I wondered where the book was really going, only to find it wasn’t really going anywhere other than that. And for this book, that is 100% okay. In Other Lands almost feels like a bunch of growing up vignettes, and the fun is really in the book’s humor, Elliot’s well-crafted personality, and his interactions with all the other characters. This one was recommended by a good friend, and although it’s not my normal genre, I enjoyed it IMMENSELY. Maybe it took me so long to read because I didn’t want it to end?